That creation care is part of the mission of the Church is widely accepted. But is creation also relevant to the other marks of mission? In the first of a four part series, jubilee’s Matt Williams and Jonny Hanson look at proclamation. Before we even open our mouths, creation is involved in proclamation; ‘the heavens declare the glory of God, and the sky above proclaims his handiwork’ (Psalm 19). The purpose of all God’s creation – including us! – is praise (Psalm 150), and when we forget this, we inevitably fail in our responsibility for the environment. This in turn can undermine our evangelism, particularly if our words aren’t matched by actions that cherish God’s world. We are also dependent on nature for all that we do, including for something as intrinsic to our faith as preaching a sermon. And this faith is itself based on following the God who left the splendour of heaven to become an incarnate part of the world He had made. Clearly, proclamation engages with creation. Part of what it means for humanity to be fallen is that we don’t see what should be obvious when we look around us. In fact, God reveals himself in creation – at least his ‘eternal power and divine nature’ – but because we’ve turned from God we just don’t see it (Romans 1:19-20). This is not to say that words are unnecessary or that the Bible is a superfluous luxury for bookish Christians. But the awesomeness of the natural world calls us to seek the creator; wrecking this same world is a sure sign that we are ignoring its call. There is nothing more off-putting than saying one thing and doing another. For onlookers (and many insiders! ), preaching about a Lord who made all and has given himself to reconcile everything to himself (Colossians 1:15-20) doesn’t sit well with carelessness over the environment. ‘Millennials’ are especially likely to notice this and whatever their many weaknesses (and both authors fit this bracket), they do have a heightened consciousness of the world’s interconnectedness. Taking creation seriously is not about the church kowtowing to a popular cultural trend but having our attention drawn to a neglected Christian principle. Just as our care for creation authenticates our evangelism, so too creation enables our evangelism. Guy McPherson famously quipped that ‘if you think the economy matters more than the environment try holding your breath while counting your money’. 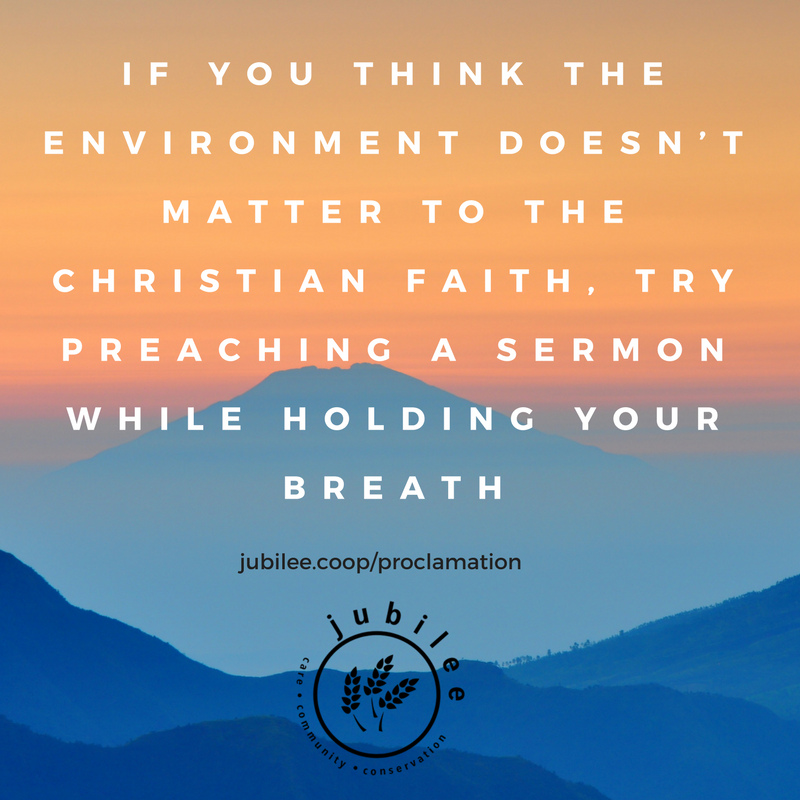 The same could be said in theological terms: if you think the environment doesn’t matter to the Christian faith, try preaching a sermon while holding your breath. Even this most basic of Christian activities requires air, food and water at the very least, and reflects the role creation plays in sustaining us. The final dimension of the creation-proclamation link draws these threads together. 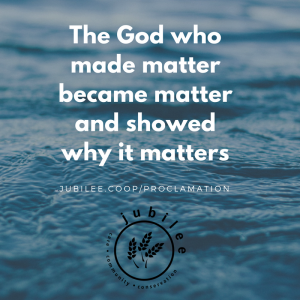 The God who made matter became matter and showed why it matters. The incarnation was completely necessary for God to do his saving work that most reveals his nature. Jesus’ life, suffering, and bearing of sin all depended on his physical body, thus refuting the Greek view that physical reality was inferior to the meta-physical. Sadly, such pagan thinking still influences how the Church under-prioritises material concerns, including the environment. Yet Christ did not just speak from heaven; he lived in the painful reality of our world. As Visser’t Hooft put it, ‘a Christianity which would use the vertical preoccupation to escape from its responsibility for and in the common life of man is a denial of the incarnation’. Whether it points to God’s greatness or enables us to do the same, creation is connected to proclamation. How we treat the environment can also authenticate or undermine our evangelistic efforts. And as long as we say ‘the Word became flesh and dwelt among us’ (John 1:14), we are reminded that Jesus’ incarnation, death and resurrection offers hope to a world, human and non-human, that sorely needs it. Thus Paul urges us to stick to this gospel hope, ‘which has been proclaimed in all creation’ (Colossians 1:23). This article was first published in the July – September 2017 issue of VOX.